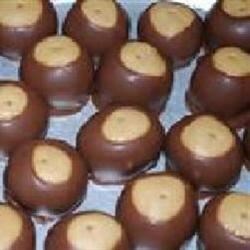 "Peanut butter balls dipped in chocolate." See how to make easy peanut butter and chocolate cookies. The peanut butter mixture was the sloppiest substance I have ever worked with. It had to be frozen or it would not stay on the tooth pick. It was incredibly soft otherwise. I needed more chocolate chips than called for. I used 2 1/2 bags. This has been an all time family favorite in our house. My mom has made these for years. They are the best food in the world. Even though i don't love peanut butter I love these.